Many B2B startups can’t afford to hire a full-time sales team. Yet, you need sales to grow your business. This is a grating pain point for many sprouting businesses. Fortunately, we discovered a way you can snowball your sales without a sales team. Better still, you can do it without paying commission. For many B2B businesses, outsourcing sales to a commission-only agent is a pipe dream. You can’t deny the upside though. Commission only salesman only get paid when you make money. There’s no risk of paying an unproductive employee. What could be better than that? Commission only sales are bliss for B2B business owners. This article will fully explore the current state of B2B commission-only sales (spoiler: the ready-made solutions on the market don’t work for most businesses). It will then show you the easiest and cheapest way to outsource your B2B sales. This secret strategy will skyrocket your B2B profits. It’s dirt cheap too. You can get started for as little as $3.00. Before we get to that tutorial, let’s explore the current market of B2B commission-only sales. After all, there are solutions and ideas on the market. It’s only prudent to check them out. Why Doesn’t Every B2B Business Outsource Sales to a Commission-Only Agent? There are people in developing countries who will work as a virtual assistant for as low as $3.00 an hour. Why not hire them on commission? At the very least, the price is right. Sales is not a straightforward task like entry-level data entry. First, the salesman must unearth qualified prospects, a technical and tedious task. Second, they have to actually sell to them. It’s exhausting to find inexpensive virtual assistants who can do both these things. This is a rare skill set, and the people who have it often demand a salary and commission. Are Commission Only Sales Really a Sweet Deal for Businesses? Commission only sales have tremendous upside. They are definitely worth searching for. Is a Commission Only Payment Structure Normal When You Outsource B2B Sales? Outsourcing Is Okay, But I Want to Outsource Sales and Only Pay Commission. Are There Websites That Will Help Me With That? There are plenty of sites that let you outsource B2B sales. Three of the most prominent ones are Commission Crowd, Your Sales, and ICYD (I Close Your Deal). The most promising website for commission only seekers is Commission Crowd. The other two sites don’t even advertise prices, but you can tell they’re not free. However, even Commission Crowd has its issues. What Kind of Issues? How Much Does Commission Crowd Cost? At the current exchange rate, the basic package of Commission Crowd costs $836.43 a year. Furthermore, Commission Crowd insists that you make a one-year commitment. They say that selling is a trust-building process, and their sales agents like to have peace of mind. Additionally, you must pay Commission Crowd a 2% commission on all your sales. This 2% commission is separate from the commission that you must pay your sales agent. That’s Quite a Lot Upfront. How Much Commission Do You Have to Pay Sales Agents on Commission Crowd? It depends. SaaS products have a commission range from 20% to 50%. Manufacturing products have a commission range from 7% to 15%, a lower number because the direct expense for each sale is higher. The better the salesman, the higher the commission they’ll demand. What’s the Minimum Sale Rule at Commission Crowd? It Looks Dismaying. Commission Crowd usually only approves products that cost more than $5,000 dollars (technically it's pounds, not dollars, but you imagine they’d be willing to stretch a point) per sale. Commission Crowd says if it’s a monthly SaaS product, it should cost at least $500 per month. For many startups, that’s an astronomical number that disqualifies them. Commission Crowd says they do make exceptions if your product is easy to sell. How they determine that is unknown. I Can Fulfill Commission Crowd’s Minimum Sale Rule. However, $836 Is a Lot to Pay Upfront. How Does Commission Crowd Provide Value? In other words, outsourcing sales can be quite lucrative. Even though Commission Crowd’s $800+ fee appears expensive, it’s dirt-cheap compared to hiring a full-time salesman. Commission Crowd also facilitates the training process. They give companies the ability to upload training materials to a convenient portal (e.g. price sheets, cold email templates, spec sheets, etc.) and they send those materials to the salesman so they will hit the ground running. Additionally, Commission Crowd gathers salesman with specialized experience in many industries. By the Way, How Long Does It Take to Find the Right Agent on Commission Crowd? Commission Crowd likens the process to online dating. They don’t give specific numbers, but Commission Crowd notes people have found the right match on the first day. Commission Crowd Has a lot of Drawbacks. Is Commission Crowd Worth It? It doesn’t work for many B2B startups because these companies usually want to sell services that cost much less than $5,000. Commission Crowd said they interviewed their salesman about this. Very few were interested in selling smaller ticket items. Apparently, they feel there’s not enough money in it. For large companies, Commission Crowd can work. Commission Crowd connects you with people who have commission only sales experience. That’s a strong plus. However, many businesses aren’t eligible. We’ll have to keep exploring other commission only solutions. Is Commission Crowd Really the Most Promising Third Party Website? Isn’t There Another Reputable Commission Only Site Without the Sales Minimum? An effective salesman doesn’t take commission only jobs selling low-cost items. For low margin services, they command a commission and a salary. If operative salespeople are on a commission only structure, they exclusively sell high-ticket items. Commission Crowd needs that sales minimum. Otherwise, retaining their talent would be burdensome. Commission Crowd Doesn’t Work for Me. What’s Next? Is Outsourcing B2B Sales Just a Pipe Dream? We did some research. Here’s the easiest way to outsource B2B sales to a commission-only agent. The First Step: Realize You Have to Provide Unique Value to Hire Commission Only Salesman. Commission Crowd works because businesses must have $5,000 receipts. That’s appealing for a salesman. If they can negotiate a 50% commission, they can get $2,500 for one sale. However, these receipts are outside the sphere of practical politics for many businesses. If you have a B2B SaaS subscription for $30 a month, or you’re selling websites for $1,000, you aren’t coming anywhere close to those numbers. Most businesses can’t attract better talent just by offering a higher commission. That’s not enough, and many times there’s only so much you can do with your margins anyway. Nevertheless, you have another option. Webster (0f Webster’s dictionary) would say, you can make your job appealing, tempting, desirable, and irresistible. You can do that by making prospecting painless for your salesman. The best way to do that is to give them warm leads. How Can I Share My Warm Leads? I Don’t Have That Many Leads Myself. Outsourcing lead generation must become your new modus operandi. How Do I Cheaply and Easily Outsource Lead Generation? Alex Berman from Experiment 27 is a pioneer of lead generation. Let’s annex his strategy. You can use Fiverr, Upwork, r/forhire or r/slavelabour). These sites allow you to post requests. That’s the easiest way because you can put instructions in your post. We’ll show you exactly what Alex does. You should outsource this process. Alex said it took him well over 2 hours, and he’s experienced. Fortunately, there’s a YouTube video with step-by-step instructions. This video will help the virtual assistant you outsource this task to. Alex’s Excel Sheets have six key categories. They are company, website, name, email, portfolio item (the best company the prospect worked with), and channel (where he found the prospect). Go to where your customers are. If your customers are on a B2B subreddit, go to Reddit. If they’re on Twitter, go to Twitter. AngelList, LinkedIn, and Product Hunt are also particularly effective for B2B sales. If you need more inspiration, check out this article. It lists 15 places to find B2B leads. 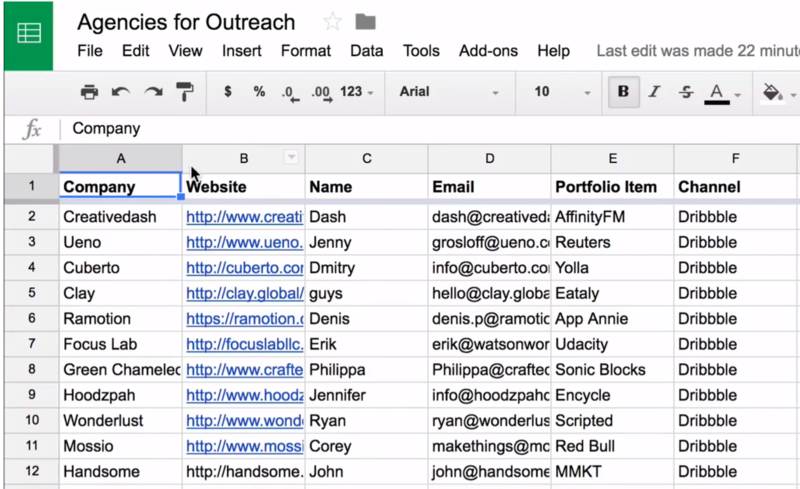 Make sure your freelancer keeps track of where they found each client. It will help to personalize your cold email down the line. Once you have their website, you can find their data. The company name and the URL are on the homepage. The owner’s name will be on the home page, the about page, or a linked social media account. Companies they worked with are rather easy-to-find too. They should be on the home page or portfolio page. This step isn’t complex, but it takes hefty spadework. The email is usually on the website too. Follow the next step if it’s not. Some companies hide their email address because they fear annoying spam. You have two ways to unearth an email if it’s not on a prospect's website. The easiest way is to use Hunter.io to find it. Lastly, you can use AnyMail Finder. It’s paid software (after 20 free credits), but it finds the trickiest email addresses. Cold emails are best when personalized. Alex got a response rate of 17.5% with this strategy, which is impressive for B2B cold email. Take a look at the email Alex sends to customers. Do you see the fluid touch points , , , ? In his YouTube video, Alex sent out 40 emails. Each company receives specific info, such as the tidbit about their portfolio. This makes the email much more personal, and it skyrockets your reply rate. Alex runs a digital marketing agency, and he’s achieved unique accomplishments. You can benchmark parts of his email, but you certainly shouldn’t send it verbatim. Hire a copywriter via Reddit to rewrite the parts that need changing. You can also benchmark other great cold emails. Make sure your cold email copy has the four personalized touch points above (, , , ). Your virtual assistant could send the emails one by one, copying the unique information in each new send. Fortunately, there’s a better way. You can use an email script; it allows you to send out bulk- and personalized- email quickly. Here’s a tutorial for that. If you use a freelancer, they may use their own email account. Alternatively, you may use an alternate domain for cold emailing. Of course, you can use your domain too. Whatever you do, make sure the replies end up in your central inbox. This is rather self-evident, but it’s a vital step. Can I Stop Here? Warm Leads Are Awesome, And I’d Like to Handle Them Myself. You could easily stop here. Indeed, warm leads are a fantastic asset, and some startup founders prefer to handle these leads themselves. Still, many entrepreneurs are quite busy, so this article goes one step further. Collecting Leads Seems Like a Roundabout Step. Why Are These Warm Leads Necessary to Outsource B2B Sales to a Commission Only Agent? Here’s the dirty secret about outsourcing sales on a commission-only basis. It’s a very undesirable job, particularly if your sales receipts are low. The demand for commission only salesman is high, but the supply is low. After all, pay isn’t guaranteed, and the salesman typically has to train himself. It’s risky business for the salesperson. That all changes if there’s an appealing benefit. Look at Commission Crowd. They function because they only partner with companies that sell high-ticket items. That makes it possible for the salesman to make a healthy income. Likewise, offering warm leads makes your sales job a lot more appetizing. It gives you leverage. It gives your job desirability. It makes things a lot easier for the salesman. Therefore, you’ll have a cavernous pool of qualified commission only agents to choose from. Find good commission only sales reps via referrals on LinkedIn or Reddit. You can’t directly hire via r/forhire, Fiverr, or Upwork, because they all demand a salary. Warm leads are the simplest and cheapest way to make your sales job appealing. Should I Start? Does Outsourcing Sales on Your Own Have Much Financial Risk? You should start. Outsourcing sales has a paltry amount of financial risk. According to Quora, you can hire virtual assistants for $3 an hour (you’ll probably pay slightly more than that). On top of that, commission only sales are risk-free. This is a low risk and high upside recipe. Even Commission Crowd, a site where you have to pay $836 to get started, is intriguing for large B2B businesses. Are There Other Risks That Stem From Cold Emailing Clients? For Instance, Will Sending Bulk Emails Harm My Domain Reputation? If you send follow the steps indicated, it’s unlikely. Circumspect marketers can buy a separate domain for cold email outreach. If you do buy a domain, send a few smaller campaigns to start. That’s called warming up the domain. Should I Hire the Cheapest Virtual Assistant Possible to Data Mine? You should hire the cheapest person who can do the job properly. For instance, some virtual assistants with rock-bottom rates have limited English skills. They’re good at straightforward tasks, but they struggle with complex tasks because of the language barrier. Just communicate with your freelancer. Show them Alex’s tutorial, and make sure they can decipher it. How Do You Pay Commission Only Salesman? PayPal and Freshbooks are good platforms. Stay receptive to the preferences of your sales force too. What Do I Do If a Top Performer Wants a Salary? Should I Pay Them? If a salesman succeeds, there’s nothing wrong with stretching a point to keep them. In the world of sales, production is king. What’s the Future of Outsourcing Sales? Still, commission only sales are far from ubiquitous. There’s a lot of demand and very limited supply. That’s why you need to provide salesman with warm leads or high ticket items. You can outsource B2B sales to a commission only agent. It’s doable. It’s not a pipe dream. Follow the steps in this article and you can grow your business tremendously. Here’s one last hint. Use email verification software to double-check the emails you get from data mining. This will increase your deliverability rate. Commission only sales are great. There’s unlimited upside, and there’s little risk to your pocketbook. It doesn’t get much better than this!